A good friend of mine called me this morning. 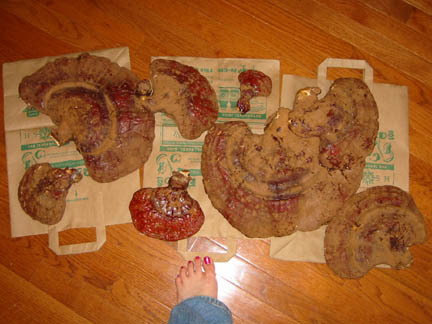 She said she and her two boys were out mushroom hunting and found some Ganoderma tsugae (or Hemlock Varnish Shelf). It’s closely related to the Reishi mushrooms and is used in a similar way medicinally. So, she asked if I would like it. I said of course, thinking I would make a little medicine for the winter. WELL, a little medicine would be the understatement of the year! They brought in 8 mushrooms ranging in size from 3 inches across to 2 feet!! 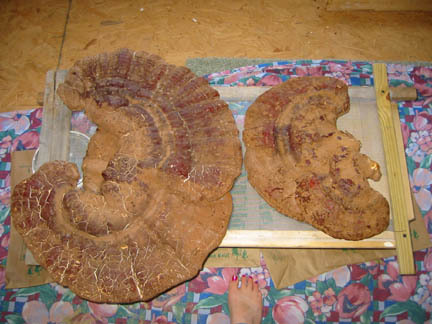 Absolutely beautiful, stunning examples of Ganoderma tsugae!! So, right now, they are on the stove. I chopped them up (while they are fresh and I could still chop them, ’cause they get hard as a rock if you let them dry) and put them in a pot of water. They will simmer until the water is reduced to a thick, dark brown concentrated liquid. Then, I will measure out the liquid and add enough alcohol to make the final product 35% alcohol. Then I will put the mushrooms back in the liquid and let it sit for 4 weeks to macerate. After that, I’ll strain the mushrooms out and voila! This process helps to extract all the medicine available in the mushrooms. Above are the smaller ones!! Wow..those are huge. Would you know what type tree they found them on? Yes, they were on a dead hemlock. This type of mushroom almost always grows on hemlock (Tsugae canadense). Hence, the name of the mushroom: Ganoderma tsugae, or Hemlock varnish shelf mushroom. Aren’t they amazing??!! Wow — those are HUMONGOUS! Wow what pretty painted toes you have my dear! This brings back memories!!! When I was a kid, we always used to find these types of mushrooms on trees in our woods in NH. The studies that I have seen do show that tsugae and lucidum produce similar immunomodulatory polysaccharides and proteins. G. tusgae has also been studied for it’s beneficial effects on cervical, lung and other types of cancers. To my knowledge, it is not considered as strong of an anti-cancer agent as the G. lucidum, but still a wonderful ‘medicinal mushroom’. My chief way of using it is more for adrenal burnout, and not as an anti-cancer agent. Tea works well, but to extract as much of the medicine as possible, I make an alcohol extract also… This is the way I was taught by my elders, and it seems to work great.